. Roof Repair Information | Roof Repair Houston | Anchor Roofing Inc. I was recently asked this question via our online request form, “Message: Hi, I would like to know how many roof repairs can you possibly handle within a month? To answer that question I sent the following back, there are many variables that go into the answer to that question. Manpower is not an issue; however the time it takes to properly inspect and identify the source of the leaks and then write a practical work scope with coinciding proposal including a conditions report for the repair/s along with the time involved for the visit to the property is a large contributing factor to the answer. 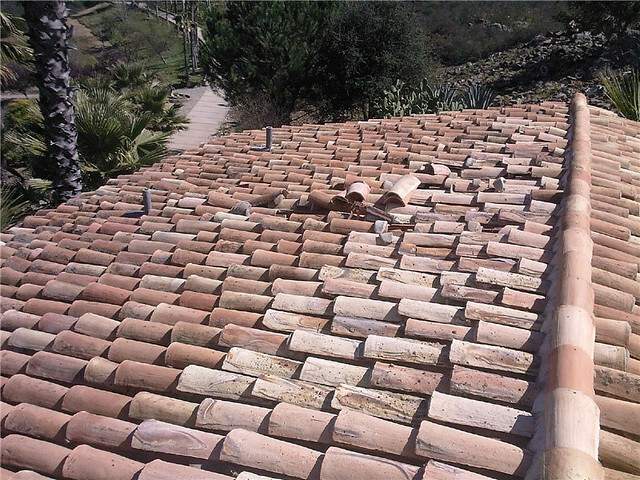 Then there are some roofs such as gravel ballasted systems that are embedded in coal tar pitch that you can put a band aid on; however there is not a permanent solution – repair wise for this type of archaic roof system, as coal tar pitch is a living organism and will move around when exposed to enough heat, and is also carcinogenic. For example water goes from liquid to solid at 32 degrees F°. With coal tar pitch the phase change from solid to a liquid / soft state usually occurs at around 85 degrees F° and there are very few repair options, and the ones that are available are temporary solutions typically coming with a 6 month warranty at most, depending on the time of year the repair takes place. Also, if it is more than just roofing involved, such as gutters, coping, re sheathing, along with other situations it requires a Commercial Minor Repair Permit issued from the City of Houston Department of Public Works and Engineering in advance and there is the time it takes to have the permit issued assuming the property has a valid Occupancy Certificate, and must be finalized upon completion by a Department of Public Works and Engineering Inspector.You can also contact roof repair Houston, professionals to assist you in renovating your rooftops a pocket-friendly budgets. There are also the liability issues when anyone goes on your roof that you want to address prior to any work being performed. If you are a Real Estate Investor and set up as an investment group, or outsourcing the building maintenance and management to a Property Management Company, then typically we will have an additional insured COI (Certificate of Insurance) issued to the management company, or investment group listed as Additional Insured. We carry Class A Rated Insurance and Workman’s Compensation insurance to protect both us and you or your clients. Some jobs may require a COI for just the property that is being repaired and having the proper legal description of the owner or relative persons is a prerequisite to obtaining the COI for that property and it can take a day or two once the information is provided before the COI’s come in. Having this in advance helps immensely to provide indemnification as well as a reputable insurer should something go wrong. Read more:- roofing companies in Houston Texas The type of repair and the location of the property play a role too, as many roof systems under long term NDL warranties require a Post Warranty Repair Form to be submitted to the roof system material manufacturer whom has issued the long term NDL warranty in advance of the repair or additional work such as new penetrations, HVAC curbs, drains, and many other items relevant, the written approval in advance from the manufacturer that you are a credentialed applicator and approved to perform the roof repair as per specifications can be the difference in a warranty seeing full term and not being voided can save a lot of potential headache. When it comes to repairs for example if it is a metal roof being repaired then the materials may have to ordered and fabricated to the proper dimensions. If it is an asphalt composition shingle roof, a built up modified rolled roofing system, or a white TPO, or PVC roof system then the process is quicker. We have a large portfolio of commercial clients and are performing repairs daily in multiple locations; however sometimes there are situations where a roof has reached the end of its life cycle and in good faith we cannot endorse a roof repair when the probability of it failing elsewhere regularly starts a never ending repair process that will cost more to put repair after repair up over a period of time versus either a retro fit system, a coating system, or a complete tear off with new roof system to Local Code as the most practical answer. Plus if it is a commercial roof system in Houston and a new roof is the best op that is not white then to meet the 2008 Houston Commercial Energy Code which was enhanced to meet the 2009 IECC (International Energy Conservation Code) then the mandated Solar Reflectivity and Thermal Emissivity must be met which also typically results in a substantial energy consumption reduction as less energy will be used to cool the building now that the Sunlight is being reflected back in to the environment, sometimes offsetting the cost of the new roof. I do not believe there is a reputable roofing company in Houston, or anywhere for that matter that could give you a for sure number of how many roof repairs they could complete in a month’s given time, as no matter where you are the weather plays a significant role. We welcome the opportunity to meet with you and discuss the issues you are having, and we have the philosophy that we can show you better than we can tell you. 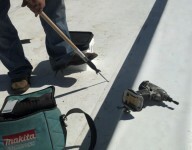 Please free to contact your trusted local Houston roofer today and schedule a FREE inspection!